MSV: Judge Arre on throwing out Lane Bajardi and Kim Cardinal Bajardi's defamation lawsuit: "No Evidence..."
Judge Arre on throwing out Lane Bajardi and Kim Cardinal Bajardi's defamation lawsuit: "No Evidence..."
Yesterday in Hudson County Superior Court, Judge Patrick Arre weighed in decisively throwing out all remaining defamation claims by Hoboken resident Lane Bajardi. One legal observer of the proceedings described the judge's findings of fact and legal opinion "a bench slap." The defamation lawsuit was originally filed on July 26, 2012 but Councilwoman Beth Mason announced it earlier in reply to Roman Brice who requested she make available the public records of her Mason Civic League (Association) at the July 11th Hoboken City Council meeting. In reply, Mason ominously threatened, "Mr. Brice is on the verge of some legal action." Exactly 15 days later, Lane Bajardi and Kim Cardinal Bajardi's defamation lawsuit was filed in Hudson County Superior Court seeking $2 million dollars in alleged damages from Brice, Nancy Pincus of Grafix Avenger and more than a dozen other commenters in the Hoboken blogosphere. Last September, the court threw out most of both Lane Bajardi's claims and all outstanding allegations of Kim Cardinal Bajardi. 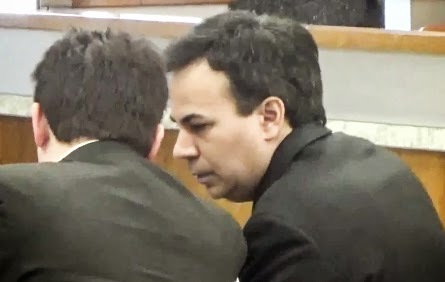 As seen in the video report courtesy of John Heinis at The Hudson County View, Judge Patrick Arre said, "No evidence has been presented here that Mr. Bajardi's position as a radio broadcast journalist has been effected." Defense counsel Alex Booth in an interview with Heinis after the lawsuit's dismissal said, "It's obvious to me from the start that Mr. Bajardi was heavily involved in politics here (in Hoboken) and was a big time supporter of Mrs. Mason." Booth added, "There was no evidence to support a verdict against any of these people, so no surprise." On the question about effort to settle the case Booth said, "It didn't seem that they (the Bajardis) were in this case for money. They were in this case for some kind of political purpose." Booth concluded saying, "It was a victory for the First Amendment." Heinis concludes his video report noting Beth Mason did not reply to a request for comment. allegations thrown out of court. The judge ruled his case did not merit going to a jury.